In a previous post I alluded to further remodeling that would be going on in our home soon. This project actually started several years ago and we simply lived with it for a while. 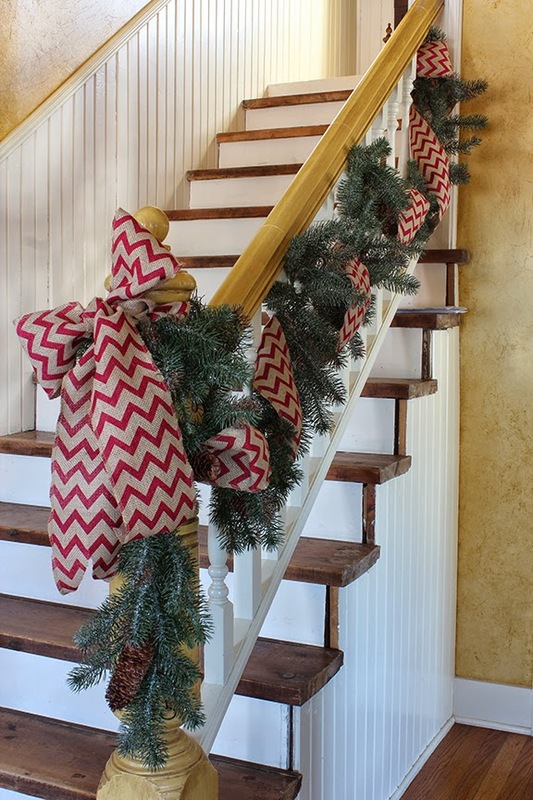 Our stairs are the first thing you see when you enter the front door and the old berber carpet on the stairs had seen better days. I have terrible allergies and getting the pet hair out of the carpet was driving me crazy. One day, while Rick was out of town on business I decided to remove the carpet. I do these things while he's away and I'm sure he's afraid each time he returns to see what I've done. Needless to say I was very disappointed to see plywood on the landing and a staircase that was meant to be covered with carpet. The two stairs at the top were the only two oak treads. 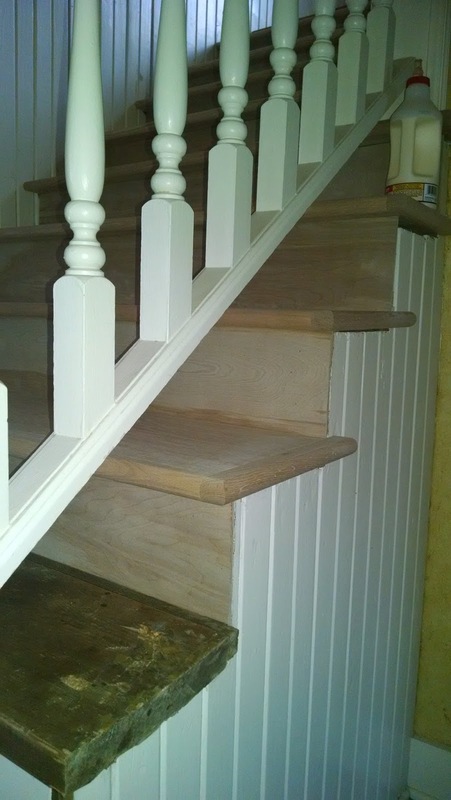 The wood wainscot didn't meet the stairs in severals places and there were lots of gaps. 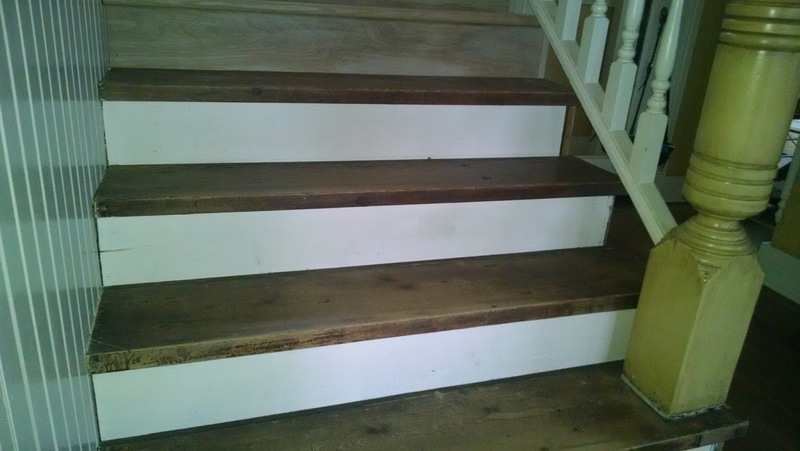 I filled all the holes the stapes left in the stairs and cleaned these up the best I could and removed the paint spills that were all over them. After all this work, I was not going to recarpet these though. I knew that someday we would get these replaced. I have no idea what year this was done but we moved here in 2001 and I lived with the old carpet for 2 or three years. Rick was more than a little shocked when he came home. But, thank goodness he is good natured about my remodeling efforts. They were at least clean and easy to dust away the pet hair. The lighting in the above picture is deceiving. They did not look this good. I generally avoided taking photographs of this area of our home. I painted the risers white thinking they would look nicer. Sorry about the Christmas picture it's the only time I took pictures of the railing. Let's get up close and see how bad these really were. Nice! But, there is hope! New stairs in progress as you can see here. I was so excited to watch as each new tread was placed into position! Our carpenter and friend, Patrick Grass did a beautiful job. This is what it looked like by the end of the first day. 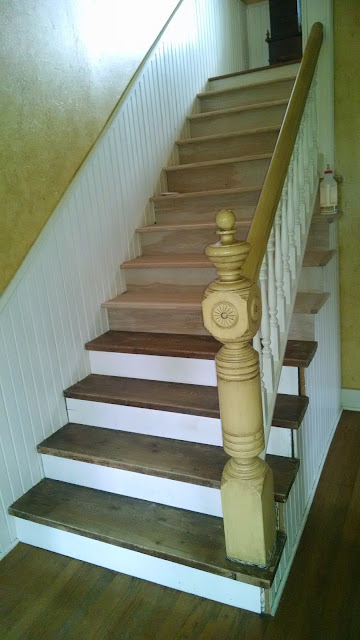 The stairs are now completely in and I will be painting the risers white one again because I had them faced with wood that I could paint to save a little. I've been sampling stains on some scrap wood and hope to start staining soon. I will share more pictures of these as I go along and when they are finished. My knees will be killing me by then I'm sure! In the mean time we are still finishing up Rick's listening room on the third floor and my paint room once Rick gets the rest of his office moved upstairs. The new boards are looking lovely. I know how disappointed you must have been when you found plywood on the landing. We ripped up old vinyl flooring in our kitchen, knowing there was oak underneath. 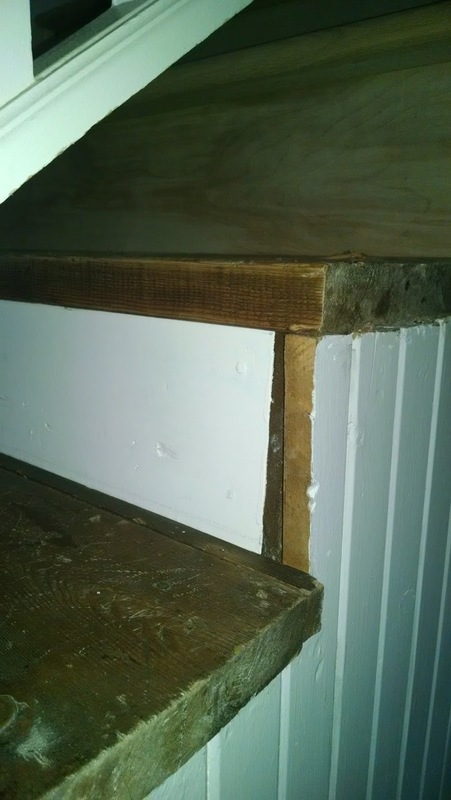 What we didn't know was a 5' section the length of the kitchen was plywood. Had that replaced and love it. You will be so happy you're doing this. Good Luck! This looks great! My sister went through this with her stairs and I remember the hard work. I should do this with my stairs, too. Good thing no one ever sees them except me! I'm looking at my own stairs, also carpet free recently, Did your carpenter friend remove the old treads? Our are warped, so I'm afraid it won't be an easy fix.